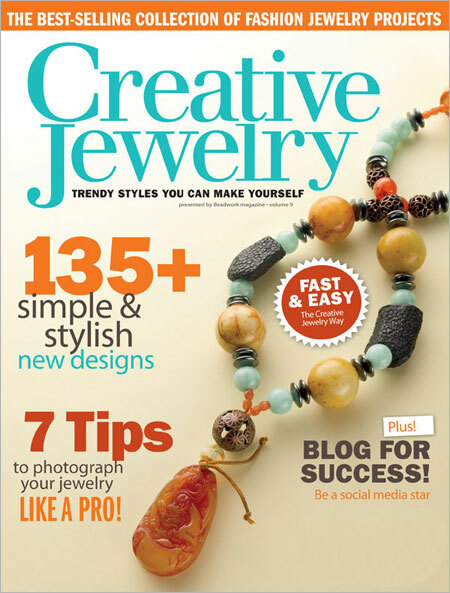 My copy of the Creative Jewelry Magazine 2011 finally arrived. I couldn’t wait to see how they presented my “Black As Night” necklace. I’ve always liked this piece because of its simplicity — what the magazine editors asked for in this issue. The ring design is my original — I’ve used it with various color themes and in several special order pieces. 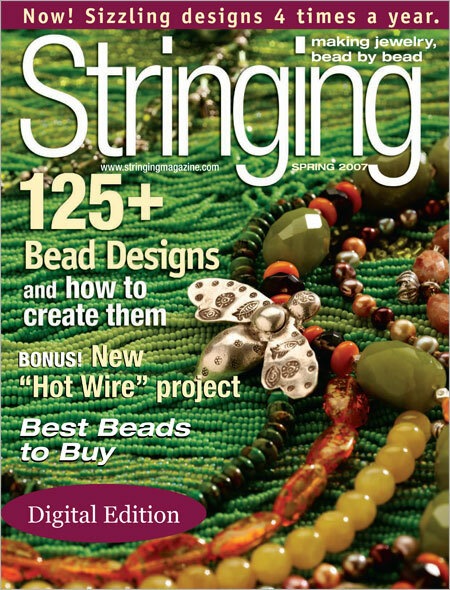 In fact, my pair of earrings with this ring design was featured in a back issue of Stringing Magazine. 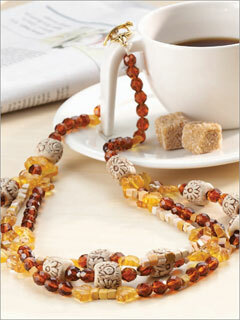 I like this design because it’s so easy to make, yet it lends a hint of drama to the necklace and to the wearer. 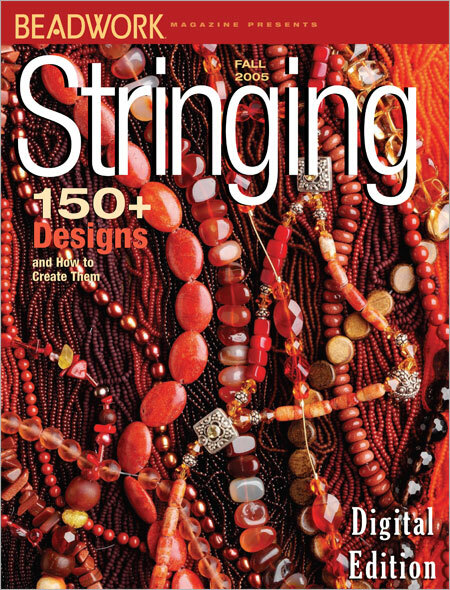 When a single string of small beads turn out to be too slim for the necklace I have in mind, I employ multi-strands of these small beads to build volume. 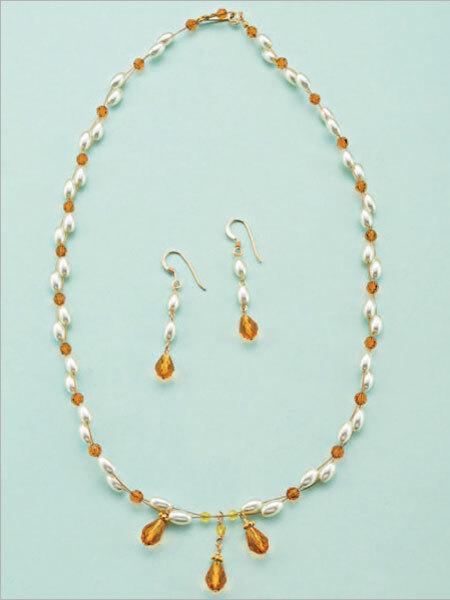 On this project, I worked with freshwater rice pearls from 3 to 5mm in size strung through two and five strands of gold beading wire. A couple of 8mm potato pearls served as connection stations. And another one as the ball in the ball-and-loop clasp. 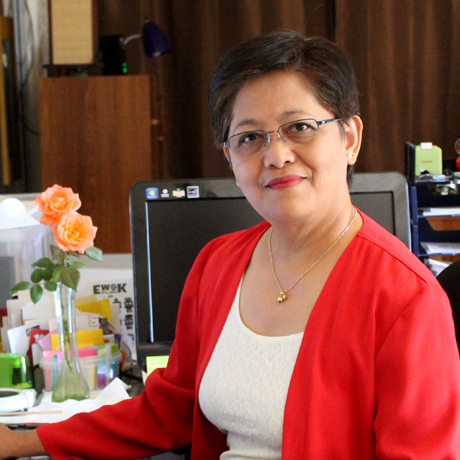 The focal point is a reddish-brown ceramic heart that I picked up at a quaint bead store at Saint Augustine, Florida. Here’s how I put it all together. 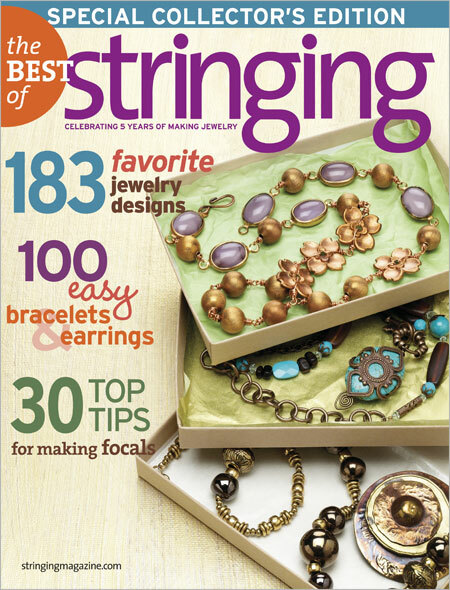 Cut the beading wire into 9 strands of 9-inch lengths. Using 2 inches of 24-gauge wire, form a wrapped loop. String 1 copper seed, 1 peacock 8mm pearl, and 1 copper seed. Close with a wrapped loop. Repeat to make two pearl stations. Pick up 2 beading wire strands and string 1 crimp tube, 2 bronze seeds, 1 peacock 8mm pearl, and 1 metallic brown 11/0 seed. Restring both strands back into the pearl, copper seeds and crimp tube. Crimp to create the ball of the ball-and-loop clasp. String (1 cathedral, 1 copper seed, 1 cathedral, 1 pearl on one strand and 2 pearls on the other strand), five times. String 1 copper seed, 1 cathedral, and 1 copper seed. Use a crimp tube to attach the wires to one end of a pearl station from Step 2. 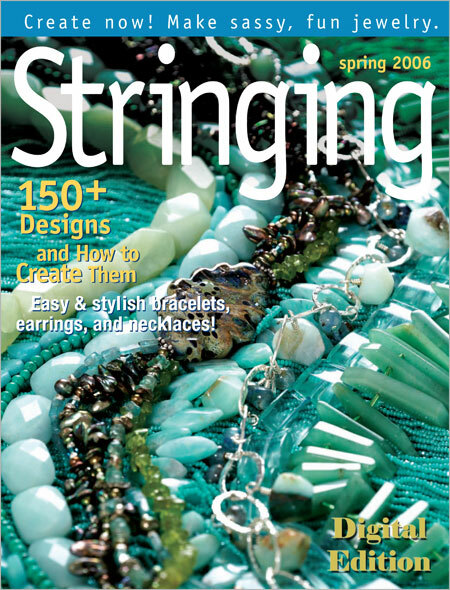 Pick up 5 beading wire strands. Use a crimp tube to attach the wires to the other end of the pearl station in Step 3. Using all 5 strands, string 1 copper seed, 1 cathedral, and 1 copper seed. Separate the strands and on each one string 1 peacock pearl. Repeat Step 5 twice. String 1 copper seed and the ceramic heart. Repeat Step 5 three times. Gather the 5 strands and string 1 copper seed, 1 cathedral, 1 copper seed. Use a crimp tube to attach the wires to one end of the other pearl station from Step 2. Pick up 2 beading wire strands and use a crimp tube to attach to the other end of the pearl station from Step 6. String (1 copper seed, 1 cathedral, 1 copper seed, 1 peacock pearl on one strand, 2 peacock pearls on the second strand, and 1 cathedral) five times. String 1 copper seed, 1 cathedral, 1 crimp tube, and 12 amber seeds. Loop back and insert the wires into the first amber seed and crimp tube to create the loop of the ball-and-loop clasp. Crimp to secure and trim off excess wires.